I wish to convey my warm good wishes to all those who worked to enable the record breaking handling of a record seven million containers in Colombo during the year 2018 – a singular achievement in the 39-year history of the Sri Lanka Ports Authority’s management of the Port. 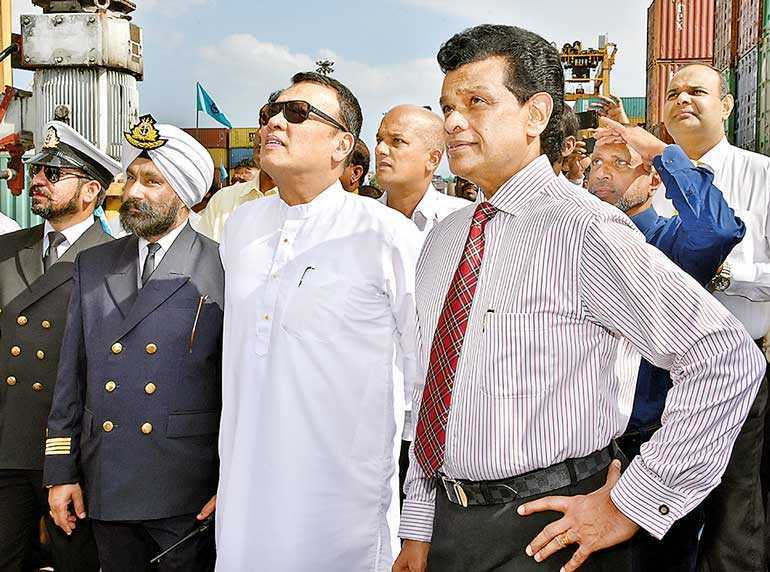 When I took office as Minister of Ports and Shipping in May 2017, despite the overall growth of plus 6.4% being shown by the entirety of the Colombo Port, the Jaya Container Terminal belonging to the SLPA demonstrated negative growth of 6.4%. Notwithstanding this shortfall in performance, through our intervention, we were able to develop and operationalise a comprehensive ‘3-year plan’ bringing together the three main terminal operators: JCT, CICT and SAGT, in 2017 for the overall development of the Colombo Port. A memorandum of understanding was concluded and a strategic business plan was initiated which greatly assisted our success. As a direct consequence, the overall Colombo Port recorded a positive rate of growth in that year. The JCT was able to show impressive growth of 24% by the end of the first quarter (Q1 – 2018) and the overall SLPA operations also grew by 16.4%. This operational progress in container operations in Colombo is well illustrated by a comparison of container handling over the past few decades. In 1995, one million containers were recorded and, a full nine years later, in 2004, two million containers were handled. This pace of increased capacity and capability continued to show gradual advancement with the three million mark being reached in 2006; four million in 2010; five million in 2015; and the six millionth being recorded in 2017.The handling on one million containers in a year is a first in the annals of the SLPA was recorded in 2018 and the Colombo Port has increased its transshipment capacity by 19.3% during the year. I would like to point out that the achievement of the seven million target was a result of our efforts on the local and international level to implement a program of action for the development of the ports and shipping sector – a program implemented during our tenure of office. This rapid development enabled the Colombo Port to win several plaudits in 2018. In the Global Container Port Connectivity rankings, Colombo rose to 13th position among international ports and first out of 30 in speedy and efficient container handling during the first quarter. These were special gains. The SLPA won recognition as the Port Authority of the Year – 2018 after a series of evaluations based on its enhanced performance and was accorded this honour by the Global Ports Forum. At this special moment, as Minister of Ports and Shipping over the past 19 months, at a juncture when the well-formulated programis bearing fruit, resulting in the current gains made by the Colombo Port, I must acknowledge the signal contribution made by Dr. Parakrama Dissanayake, then Chairman – SLPA and, at present, Secretary to the Ministry and his Board of Directors, senior management, the SLPA and associatedterminal operations as well as the staff and workers who are all deserving of our sincere appreciation. Our achievement was also made possible by all trade union activists who cooperated in ensuring and maintaining industrial peace and were instrumental in our collective victory over the past 19 months. I also congratulate the present Minister of Ports and Shipping Sagala Ratnayaka, on his appointment and wish that every progressive initiative taken in the future with regard to the SLPA meets with unqualified success.